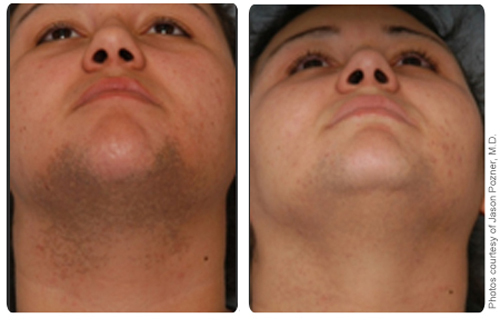 Laser hair removal is one of the fastest growing procedures in the country. The treatments are quicker and easier than waxing, more effective on large areas than electrolysis, and safer on the skin than a dull razor in a dark shower at 6 am! Laser (light) energy is selectively absorbed by the melanin in hair follicles and converted to heat, diffusing and injuring stem cells in the bulb and bulge. Effective hair reduction can only be achieved during the active growth phase and hair reduction is considered permanent when a significant amount of hair does not return for a period of time longer than the complete growth cycle. After a series of treatments, most hair is permanently removed! ClearScan by Sciton™ is an excellent solution for treating skin of color. It is proven to be safe and efficacious for all skin types (Fitzpatrick I-VI) and tanned skin, for permanent hair reduction, and treating vascular lesions, benign pigmented lesions and wrinkles. Patients have virtually no downtime and may resume daily activity immediately following treatment! The Laser cannot detect hair without pigment such as blonde, white or grey, and cannot treat this type of hair. If a person does not have much contrast between the pigment in the skin and in the hair, (ex. Hair is too light or skin is too dark) the treatment may not be effective for destroying hair without damaging skin. This person would not be a good candidate for treatment. Clients must refrain from sun or tanning booth exposure in the areas to be treated for six to eight weeks because tan skin has activated pigment cells and can absorb the light causing unwanted side effects. Hair grows and sheds from the body in cycles. Not all hair is actively growing at any given time. To destroy hair as it enters the actively growing phase we must treat the same area several times over a period of several months. This means that most people will need an average of 4-8 treatments. Treatments will be spread out from 4 weeks to 6 months apart as determined by the technologist. Clients must not pluck or wax hair in between treatments because this will disrupt the growth cycle making it impossible for all the hair to be destroyed at the proper time. New hair can begin to grow in an area that has been treated as time goes by. This growth can be caused by hormone imbalances, normal hormone shifts, medications, supplements, stress and other factors. Most clients will only have a slight redness to the area for a short time after the treatment. Discomfort – A quick stinging or hot sensation as the light fires. Redness – generalized or centered around the follicle. Lasts a few minutes to a few days. Swelling – around the follicles. Lasts a few minutes to a few hours. Soft Scab – Small crusts especially to darker pigmented areas (freckles, birthmarks, moles). Folliculitis – Infection of the hair follicle, similar to a pimple. Pigment Changes – Hypopigmentation lightens the skin especially if the area is tan. Hyperpigmentation darkens the area , more likely to happen on dark skin. These changes usually resolve over a period of time and can be helped by exfoliating or bleaching creams. Burns or Blisters – These are rare and generally mild, healing quickly. Most common on tan or darker skin. Client would want to keep area moist with Polysporin and not pick at any scabs. Area will heel in about a week. Refrain from sun exposure at least 4-6 weeks prior to treatment and 2 weeks after treatment to keep area from hyperpigmenting. Leave hair slightly visible, but short, prior to treatment. (Shave area 1-2 days prior to treatment. Stop any plucking or waxing at least 4 weeks prior to treatment). Refrain from plucking, waxing or electrolysis at least 6 weeks prior to treatment. After treatment apply cold pack or aloe gel to any warm areas. Do not shave or apply makeup/deodorant to area for 24 hours post treatment. Do not pick at any soft scabs, keep moist with Polysporin. Photosensitive medications should be stopped 48 hours – 2 weeks prior to having treatment depending on medication. People with diabetes should not have treatment on extremities and require a physician’s note. Women should refrain from treatment during pregnancy due to hormone shifts and subsequent hair growth, but may receive treatment with physician’s permission. Blonde, grey and white hair cannot be treated and red hair results vary. People who suffer from cold sores may need to take preventive medicine if having treatment to lip area. People taking Accutane cannot have treatment until they have been off the medicine for 6 months. People taking blood thinners such as Coumadin cannot have treatment while on these medications. Due to the changeable nature of the human body results vary from person to person. The information and images above are provided by Sciton, Inc. as an informative tool for the patients of physicians who are officially registered with Sciton, Inc.